Joaquin Phoenix stars in "The Brad Pitt Story"
The question of whether the meltdown of Joaquin Phoenix, recounted in the film I’m Not Here, is real or an elaborate hoax is at once both inconsequential and crucial to accurately assessing the picture’s merits. For the record, I have disbelieved Phoenix’s announced withdrawal from acting and decision to launch a career as a hip-hop artist ever since his incoherent, disheveled appearance on Late Night with David Letterman back in February of 2009 to promote the film Two Lovers. While the actor’s tells from that interview are too numerous and nuanced to elucidate here, my skepticism was only heightened after viewing I’m Not Here. Maybe the tipping point was the scene when Phoenix is offered a supporting role in the movie Greenberg during a visit to his home by funnyman Ben Stiller, the film’s star, and not Noah Baumbach, its writer-director. Or, maybe it’s the fact that the production company formed by Phoenix and Casey Affleck – Phoenix’s brother-in-law and the film’s credited director and, ahem, co-writer – is named They Are Going to Kill Us Productions. And, anyone still uncertain should stick around for the closing credits, during which they will discover that Phoenix’s father during a climactic visit to Panama is played by Tim Affleck, Ben and Casey’s dad. Critics are divided on both Phoenix and the film’s authenticity. Roger Ebert, for one, trumpets its veracity and, after hedging his review by writing, “(i)f this film turns out to still be part of an elaborate hoax, I’m going to be seriously pissed,” goes on to lecture Phoenix about his bad behavior (“a waste of the gift of life”). Detractors declare that if this chronicle of Phoenix’s mental breakdown is real, then the film is sad and exploitative; if it is “fake,” then the entire project is just irrelevant and narcissistic. In reality, this debate over I’m Still Here’s truthiness is both a red herring and part of the film’s reason for being. Phoenix has always had a complicated relationship with the vocation of acting, dating back to his days as a child actor. Indeed, the fact that it is likely an Andy Kaufman-esque riff on Hollywood and the trappings of celebrity actually makes certain elements of this meta-documentary more praiseworthy. For one, it transforms Phoenix’s act from pitiable to an award-worthy performance – performance art, even – ranking among the best roles of his career. The same could be said for Sean “Diddy” Combs, whom Phoenix pursues with Ahab-like zeal in an effort to convince the hip-hop mogul to produce his debut rap album. Combs lampoons his aloof public persona while also engendering an appreciation for his artistic and business acumen. The point of I’m Still Here is not whether Joaquin Phoenix is still all there. Instead, the salient issue is the very real public reaction to his purported collapse. The film opens with a montage of accolades Phoenix received in the wake of his Oscar-nominated performance in Walk The Line: one talk show and awards gala appearance after another, answering the same vapid questions in interview after interview. Only in Hollywood can a hug and kiss be the most insincere form of personal expression. Soon thereafter, Phoenix publically declares his intent to quit acting during an October 2008 appearance at a benefit play for Paul Newman’s Association of Hole in the Wall Camps. It is amusing to note that even as Phoenix is in the midst of ostensibly bowing out of the film industry, he complains that Affleck gets to perform with Tom Hanks and Jack Nicholson while Phoenix gets stuck reading alongside Danny DeVito. Over the ensuing months, Affleck’s roving handheld camera – which, curiously, manages to shoot many supposedly verite conversations from multiple POVs – captures the actor’s delusionary descent. In between his pursuant of Diddy and efforts to book rap performances at clubs from Miami to Vegas, Phoenix rants like a lunatic, snorts cocaine, cavorts with call girls, and generally abuses his two man-servants/hangers-on (at least when they aren’t clipping his back hair). Principal among them is Antony “Anton” Langdon, former guitarist of the British rock band Spacehog, who spends most of the film alternately prancing around naked, allegedly selling Phoenix’s secrets to the press, and, most infamously, appearing to defecate on a sleeping Phoenix after an especially vicious argument. While particularly repulsive, that latter scene is, strangely, the film’s most symbolic moment. I’m Still Here represents Phoenix and Affleck – both younger siblings of brothers devoured by the tabloid press – taking a giant dump on the entertainment industry. In fact, the conspicuous lack of any of mention of River Phoenix is the film’s glaring element of restraint and the most telling sign that I’m Still Here is a put-on. Any true examination of Joaquin’s scarred psyche would unavoidably require mentioning the night in 1993 when River died from a drug overdose on a Hollywood sidewalk as a 19-year-old Joaquin – who then known as Leaf – screamed for help to a 911 dispatcher. 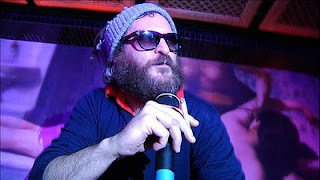 Instead, we get Phoenix diving offstage to attack a heckler at a Miami nightclub after a particular woeful rap set, all while other patrons wear mock beards patterned after Phoenix’s comical guest spot on Letterman. Even if Phoenix’s public antics were faked, what’s undeniably “true” is the media fervor that surrounded Phoenix’s bizarre behavior, how he was pilloried for essentially daring to step outside a circumscribed box. Odd or not, all Phoenix really did publically was grow a beard and declare his desire to quit acting and take up music instead. For that, he was ridiculed mercilessly. Because it is a hoax, I’m Still Here isn’t a window into Joaquin Phoenix’s consciousness. Rather, it’s a mirror reflecting our own.